The new flag of Somaliland, the former British part of Somalia which declared its independence some years ago, is three equal horizontal stripes of green-white-red. On the green stripe is the "shahada" in white script, exactly like in the flag of Saudi Arabia. The white strip contains a black five pointed star. On the bitmap the flag is 175 pixels high and 305 pixels long, so if these are the real proportions it's approx. 3:5. "The new Somaliland flag was introduced on 14 October 1996, the opening day of the National Conference. The flag had been approved earlier by the National Conference." The five points of the star stand for either the five historical areas of Somalia or the five areas where the Somalis live - now there are the two Somalias (however tenuous) united, the eastern part of Ethiopia (Ogaden? ), Djibouti, and E. Kenya? This is probably one of the only flags I can think of that expressly states its designs on other nations territory. Another is the Bolivian ensign - it's simple existence states Bolivia's long standing claim for sea access, currently held by Chile. The star symbolizes to Somali people, and the five branches: Ogaden, Issas (Djibouti), North Somalia (British Somaliland), East Somalia (Italian Somalia), and the Somalis of North Kenya. I include a link to the official website of Somaliland government showing the correct flag. coloured green and has inscribed in its midst in white in Arabic language (the phrase) La Ilaaho Ila-Allaah Muhammad Rasuulah-Allaah (There is no God, but Allah and Mohammad was his Prophet); the middle section is white and has inscribed in its midst an equally sided five-pointed black star; and the bottom section is coloured clear red. I was reading and surfing your site concerning the new or current flag of Somaliland (green, white and red with Shahada and black star). I was lucky to have been in Hargaysa, the Somaliland capital, in 1996 just before the re-election of the late Somaliland president, Mr.M.I.Egal. 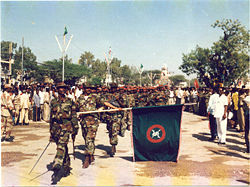 The flag that one saw around 1990 belonged to the SNM (Somaliland National Movement). The SNM was the rebel group which started the long war for Somaliland liberation against the former dictator of Somalia, Ziad Barre. Their flag was three horizontal stripes of red, white and green with the Shahada on the white stripe but without the black star. At that time, more than 10 years ago, Mr Egal was not even in the country. There was no single political party. The only political and military organization ruling the country was the SNM. This group was supported by the people of Somaliland. So, after the second flag (white with green disk), the Somaliland Parliament decided to adopt a new and meaningful flag. In memory of the fallen SNM heroes, the Somaliland parliament decided to adopt the flag of the movement SNM, but with some changes. They put the green on top, white in the middle, red at the bottom with the Shahada on the green and a black star on the white stripe. Red for the blood of the fallen heroes of the liberation. The Black star is for the demise of the united Somalia's dream. This flag did not belong to any party but to the SNM which Mr Egal wasn't even a member of. Mr.Egal later passed away on May 2002 in Pretoria, South Africa, and was buried at his home port city of Berbera. The new president, former Vice-president of under Mr. Egal, is Mr. Dahir Riyaaleh Kahin. On JJ's site it states that the Somaliland flag was adopted in 1997. The old flag of Somaliland is plain white with a green disk in the center. Around the disk the shahada in black (in a very un-calligraphic way). The current Somaliland flag may have been introduced after the proclamation of independence on 1991-05-18, because I have seen some images of the independence proclamation (unclear images on a TV documentary) and the flag hoisted was horizontal red, white, green in proportions 1:2:1. Perhaps this was the Party flag (or an version of it) of the current president Egal. Somaliland has just this year issued a new 50 Shilling note and four commemorative notes celebrating its "Fifth Year of Independence". All the currency of Somaliland features its coat of arms - the Kudu (?) that was the emblem used on its old British colonial ensign. The Republic of Somaliland (which isn't recognized as independent by any other country) has a National Charter (Constitution). In Article 1 - Section D and E - are described the national symbols of the republic. It's not yet known when the National Charter went into force. D. The National Flag of Somaliland is white in colour with a green circle in its centre, encircling the green circle and written in Arabic is the attestation to the one-ness of God, 'There is no God but ALLAH and MOHAMMED is his messenger'. E. The National Emblem is a FALCON which is brown in colour. Emblazoned on the chest of the falcon and written in Arabic is the caption 'GOD IS GREAT'. The FALCON carries on its head a weighing scale which is black in colour. Beneath the weighing scale, two hands in a friendly shake are shown. Along the side of the FALCON and in a semi-circle fashion, two Green Boughs connected at the bottom with a decorative bow-tie [sic] are shown. Above the FALCON and in the space between the tip of the Green Boughs a caption written in Arabic reads 'In the Name of ALLAH, the Most Compassionate, the Most Merciful'. Source: Constitutions - What they tell us about national symbols, by Pascal Vagnat and Jos Poels (SAVA, Dec 2004). Having watched a documentary on BBC2 about a guy tracing the Victorian explorer Richard Burton's tracks across northern Somalia, i.e. the area that declared itself independent as the Republic of Somaliland in 1991: The programme ended with a short bit filmed in Hargeisa, the capital, saying how Somaliland had established itself as a stable and democratic state, even if unrecognised by the rest of the world. Anyway, I was keeping my eyes peeled for the Somaliland flag, and it was shown twice, once flying and once hanging behind the platform at the Somaliland parliament. The principle difference of both depicted flags from the one above was that the Shahada is much smaller than on Mark Sensen's image, separated from the top and bottom edges of the green stripe by borders equal to half the height of the script and no more wider than twice the width of the black star, possibly a bit less. [cos98] report an aircraft marking for Somaliland 1991 under "there were reports" section (that means: !handle with care!). It is the main part of the old flag (i.e. red disc and inscriptions) on white disc. There is no confirmation from other sources. Latvian vexillologist Ilmars Bite sent the following link to the Russian vex-list RussoVex which shows a photograph with the flag of the Somaliland armed forces. which includes clans from Somaliland, Saylac, and Lughaye located northwestern of Somalia. Somaliland has been controlling itself since its breakaway. Awdal is clan based division based on a 16th century sultanate in the westernmost region between Somaliland and Djibouti inhabited by Gadabursi subclan of the Dir. Somaliland and Adwalland are vying for control of this region. Awdal State of Somalia wants to be part of a federal government of Somalia. Its second anniversary took place in Switzerland on 20 March 2012. The closest that Rashid Aw Nor Hirsi, the president of Awdal State of Somalia, can travel is Mogadishu and the areas where Somaliland army have no presence. rather than Somaliland. The Dhulbahante clan, a sub clan of Darod clan, is dominant in the regions of Sool, Sanag and Eyn and has maintains the SSC militia fighters who fought against Somaliland in Buuhoodle. Major politicians including Ali Khalif Galeyr, a former Somali prime minister and lecturer at US universities, backed the conference. The Khatumo state of Somalia will have three presidents, rotating on a six month basis, and a supreme council comprising of three members, and a cabinet of six members. The three routine presidents are: Ahmed Elmi Osman (Amed Karash), Mohmaed Yusuf Jama (Indhasheeel) and Nur Elmi (Biindhe). In March of this year, the TFG officially recognized Khatumo. In March 2012, the TFG recognized the state, but rescinded this few days a later. Somalia is made up of the old British and Italian Somaliland protectorates, while French Somaliland went on to become Djibouti. During the civil war Somalia has broken into two parts. The North seceded not only to escape the war but also to get rid of the dominance of the South. As far as I know all the presidents (only two before the war?) came from the former Italian part (as well as the major warlords of today). So far, no other country has recognized the declaration of independence.